Users licensed for the data service can access our Canada gas balances by clicking here. Production data from the WCSB has been pointing towards diminishing y/y growth in the second half of 2018. 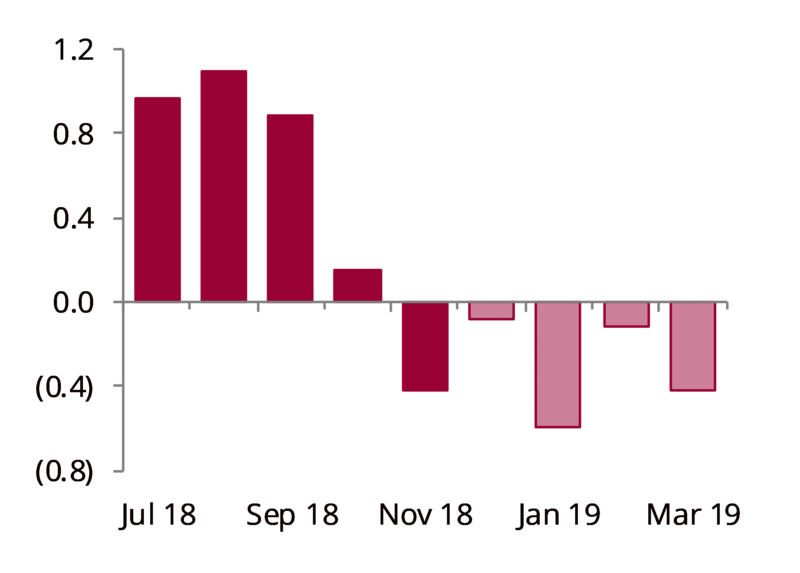 Official Alberta output data show that growth turned negative in November 2018 (-0.3 bcf/d y/y), earlier than we expected. Production shut-ins resulting from low AECO-C prices, and October’s explosion on the T-South pipeline that commingled flows between Alberta and British Columbia (BC) are likely behind the drop. We forecast WCSB production will fall by 0.3 bcf/d y/y during the current heating season, as freeze-offs due to early January cold and a 0.6 bcf/d outage at the McMahon gas plant between 2-19 January also weigh on output. The cold weather has manifested in January-to-date Dawn withdrawals of 1.4 bcf/d that are up by 0.6 bcf/d m/m. Even with higher withdrawals m/m, Eastern inventories are back to a y/y surplus after last year’s bitter January cold. We forecast an end-March carryout of 80 bcf for Eastern Canada, up by 40 bcf y/y. The improving storage situation, along with imports from the US via Rover, drives our projection for Dawn prices to remain tightly rangebound to Henry Hub, averaging a discount near a dime through the winter. In Western Canada, our price forecast calls for a $1.85/mmbtu discount between AECO and Henry Hub in the 2019 injection season. Our outlook calling for y/y declines in the WCSB during the 2018-19 heating season has begun to materialise earlier than we had anticipated. While we have long expected an overall drop in Western Canadian output this winter (see Monthly: Canada – Arrested production, 28 November 2018), our forecast accelerated to a 0.3 bcf/d y/y reduction (from a 0.15 bcf/d y/y decline) after Alberta Energy Regulator (AER) data for November 2018 posted a y/y decline of 0.3 bcf/d y/y as well. This came in contrast to our flow data—covering approximately 90% of WCSB production—which showed 0.2 bcf/d in y/y Alberta November 2018 gains and no change y/y in WCSB receipts. Both the official data and our flow sample had shown 0.9 bcf/d y/y gains in 2018 through October, with November the first significant difference between the figures. The discrepancy is likely down to a combination of factors. 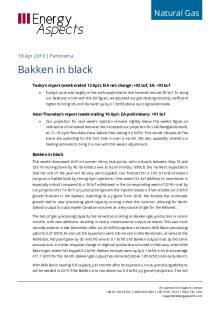 Several producers, including Canadian Natural and Crew, had broached shut-ins due to low AECO-C prices in Q3 18, which could have offlined more output than anticipated (see E-mail alert: Low AECO prices are already weighing on Canadian gas production, regardless of Alberta oil cuts, 7 December, 2018). Flows are also often commingled between Alberta and BC as pipelines cross the provincial border in the Montney basin. This commingling was likely exacerbated after the explosion on Westcoast Energy’s T-South pipeline in October 2018, necessitating more inter-province gas flow, which is skewing our sample. The November 2018 data, both from the AER and from our flow sample, show a continuation of a trend that has been building since Q3 18. While January–October 2018 growth was 0.9 bcf/d y/y, gains diminished toward the end of the period—August y/y growth of 1.2 bcf/d slid to 0.8 bcf/d in September and then to 0.6 bcf/d y/y in October. This was backed up by Canada’s drilling activity. BC saw 459 wells drilled in 2018, down by 134 y/y, while Alberta’s total of 849 through January–November was lower by 345 y/y. The abating growth and the drop in drilling activity serves as the fulcrum of our forecast for a 0.3 bcf/d y/y decline in WCSB output this winter. Our flow data show WCSB flows are off by 0.6 bcf/d y/y month-to-date in January. Freeze-offs potentially cut into Alberta production in early January, as the province endured sustained low temperatures of -20°F from 7-11 January. The true effect of the weather disruptions is clouded as local infrastructure maintenance also took place. Westcoast Energy’s McMahon gas plant was between from 2-19 January for repairs to the facility’s flare piping system, which reduced regional output by up to 0.6 bcf/d for the duration of the unexpected work. After a mild December 2018 with HDDs in Canada 7% below their five-year average, January has seen a return to normal weather and higher seasonal stockdraws. NGTL daily storage receipts in Alberta in January have averaged 1.4 bcf/d month-to-date, up by 1.0 bcf/d m/m and synced with the month’s five-year average. Every day since 4 January has seen the NGTL draw more than 1.0 bcf/d after only three previous days hit that threshold in the first two months of winter. Withdrawals in Eastern Canada of 1.4 bcf/d so far in January are up m/m as well, by 0.6 bcf/d. Given the intensity of last year’s cold though, not even the combination of lower production and higher draws will shift Eastern Canadian storage back to y/y deficits. January 2018’s withdrawals in Eastern Canada averaged 2.2 bcf/d, including the ‘snow bomb’ week when 4.4 bcf/d was removed from Dawn. This has helped the East move from flat y/y inventory levels in late December to a projected 40 bcf end-March carryout y/y surplus, with 80 bcf in inventories. If the current forecasts for a colder February come to pass, imports from the US Northeast should lower the amount of gas needed from inventories. Thanks to the additional flows on Rover and NEXUS, the St. Clair border point in Michigan has seen 0.4 bcf/d more in y/y imports into Canada since starting on 1 June 2018. 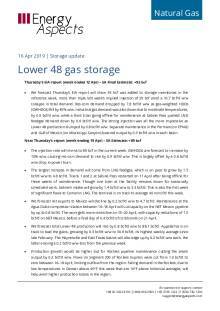 This influx of US gas along with the improving storage situation will keep Dawn prices in a relatively tight range to Henry Hub, with little upside possible. We project a Dawn discount to Henry Hub of near $0.10/mmbtu through the winter and of $0.30/mmbtu during this year’s injection season given normal weather. Improving inventories are one of several factors that will keep AECO-C prices down this year. We forecast an average $1.85/mmbtu discount between AECO and Henry Hub in injection season 2019. 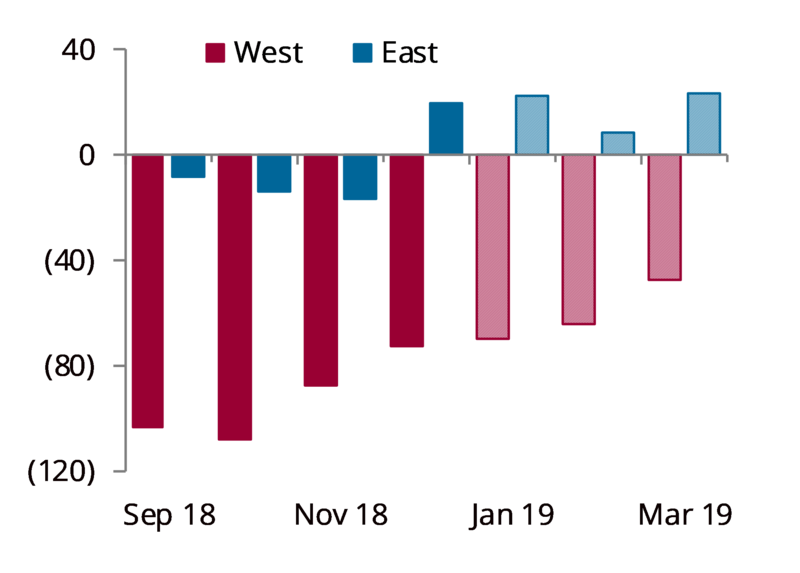 Projected end-March Western Canada gas stocks of 430 bcf will be down by 50 bcf y/y, a recovery from the 105 bcf y/y deficit at the start of the heating season. Summer maintenance on the NGTL system, while projected to be lesser than in 2018 based on preliminary schedules, will also constrain AECO on days when flows are limited through the Empress/McNeill point towards to the US border (see E-mail alert: Blame TransCanada! ...even though 2019 pipeline maintenance set to be lighter than 2018, 10 January 2018). The potential for unscheduled maintenance, as well as moderate weather (our reference case calls for 10-year normal weather), lends risk of deeper discounts for AECO basis than our current forecast.